Give it purpose—fill it with templates, extensions and more. Forgot your password? Reset here? Display option to either upload design or use design tool? This product user guide hasn't been uploaded! Pandora is perfect enough for multipurpose booking requirement that must install on your site right now to get more benefits. Advanced search form: With a search form, customers can find their favorite tours quickly by clicking on check-in date, check-out date, Town and Type. Image slider: With image sliders, customers can preview the place that they love to travel. Review: Reviews can either be automatically approved or not, customer can enter comment easily and other reviewers can see other good comments. Address with Google map: With detailed address and Google map, you can locate the exact location of the tour. Room type's management: There are different types of rooms which customers can choose suitable rooms for their group. Facilities: It is easy to list all activities of the tour as packing, food & drink, media & technology on the detail page. Contact form: Customers can send their inquiries in product detail page to shop owner in the fastest way via contact form. Price summary: Customers can review the total price to pay before deciding to book rooms. Payment gateways: Customers can choose a payment gateway that is suitable for them as PayPal, Stripe, Cheque, Western etc. Multilanguage: Jomres offers dozens of language files which are updated constantly in the process. 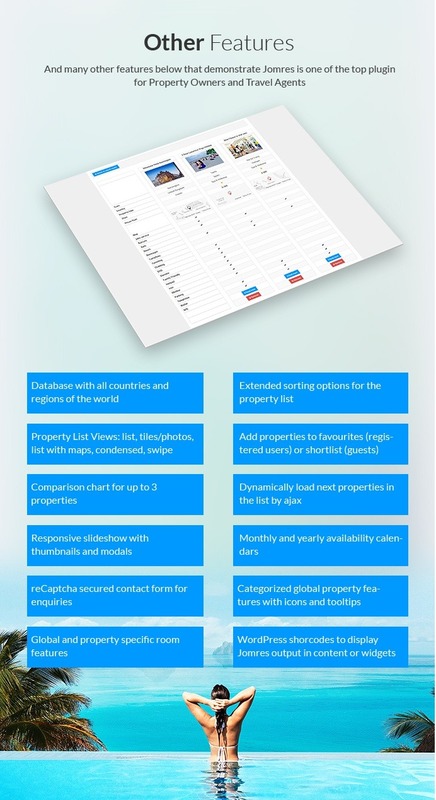 It also offers a variety of tools that site and property managers can use to translate their properties. Upcoming Event: It helps customers follow, full control and subscribe to all events. 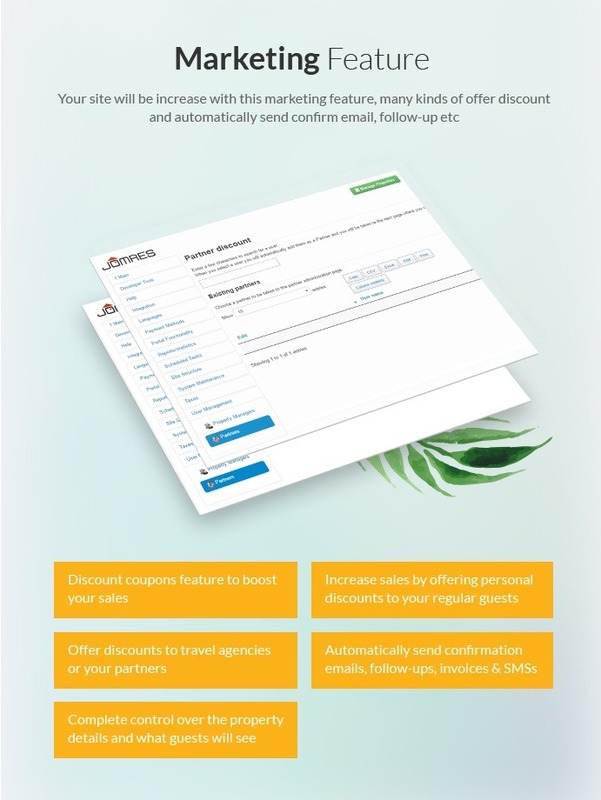 Account Details: Customers can see all booking detail after they log in to their account. Tour Frontend management: You do not need to log in on C-panel because you can manage all your tours on the front-end. 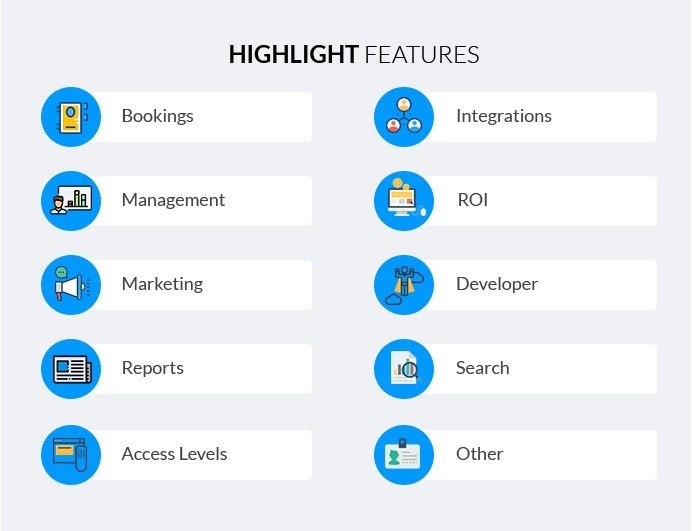 Booking dashboard backend: An administrator can manage general booking as Control Panel, Site configuration, Languages, Payment Methods, etc in the backend. Responsive: With responsive function, all layouts will fit and look great on different sizes of any device as desktop, smartphone or tablet. Quick login by social accounts: Customers can quick login easily by social account as Facebook, Google account without registering. Testimonial videos: Customers love to hear reviews from many people as an unbiased perspective so it is a reason why testimonial videos are so powerful. Awesome Blog: Unique and clear blog posts will help customers understand better for tourist destinations. Nice Gallery: It is a place that keeps beautiful memories about synthetic extracurricular activities. Cross Browser Compatibility: Our theme is absolutely compatible with the cross-browser such as Chrome, Firefox, Safari and IE 9, IE 10, IE 11. Bookings: This feature is very useful for your site when customers booking their rooms even with many complicate attributes. Create unlimited guest types - adults, children, infants, pensioners, etc. 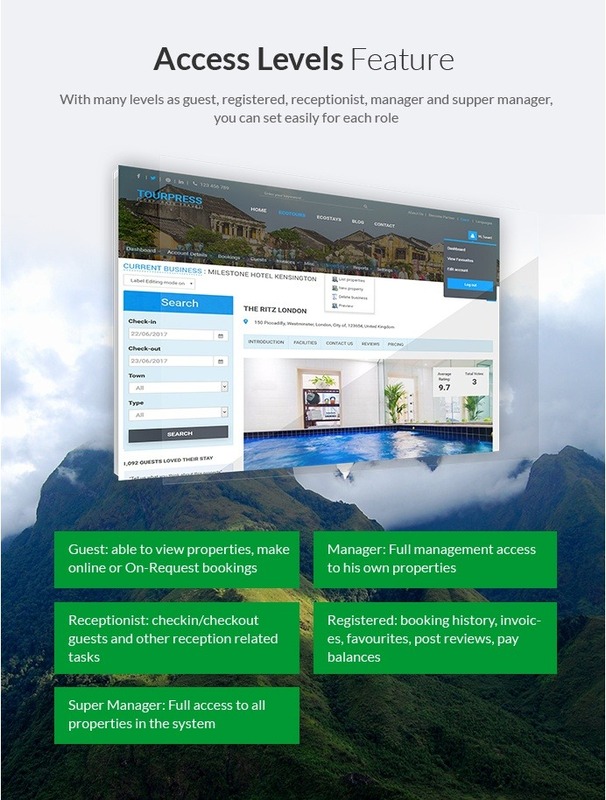 Management: Easy to manage customers' check-ins and checkouts, unlimited rooms, approve/ unapproved and publish/unpublished properties and so on. Access Levels: With many levels as guest, registered, receptionist, manager and supper manager, you can set easily for each role. Integrations: Your site will be integrated many features as Google maps, Wikipedia, Piwik Analytics and so on. ROI: This function helps shop owners get commissions charge monthly on their site for listing their properties. Developer: Many functions for developers that help them work easily without troubles. Override mini-components and classes from a custom code dir. Search: Many kinds of Search options that help customers find what they need quickly. 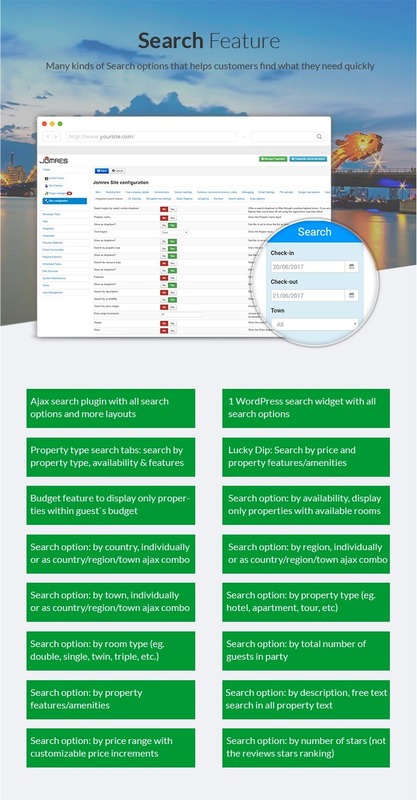 Other Features: And many other features below that demonstrate Jomres is one of the top plugin for Property Owners and Travel Agents. Image BG Cover, Contain, Tiled, Alignment, etc. Bullet, Button, Tabs and Thumbnail Navigation, single or mixed mode. Any position like outter, inner, aligned etc. Left/Right, Top/Bottom Mouse Scroll events. Page Builder by SiteOrigin makes it easy to build responsive grid-based page content that adapts to mobile devices with pixel perfect accuracy. It's a whole new dimension to content creation that'll help you create your home, contact, about us or any other page where a linear layout won't convey your message. It's a powerful enhancement to the WordPress content editing experience, yet it feels entirely familiar. A simple drag and drop: interface means you'll never need to touch a line of code. 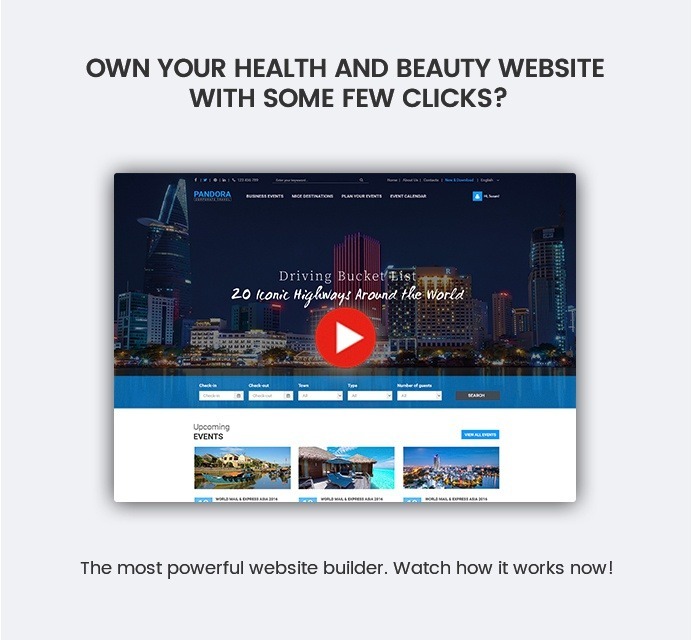 You can rely on page Builder to do what is does best – all the difficult work, generating light-weight, SEO friendly code. 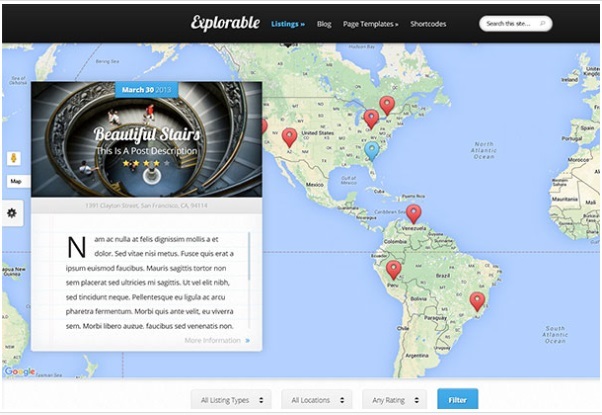 A page users and search engines will love. Works with your WORDPRESS PRINTSHOP THEME: Page Builder isn't a commitment to a single WORDPRESS PRINTSHOP THEME or even a WORDPRESS PRINTSHOP THEME developer. 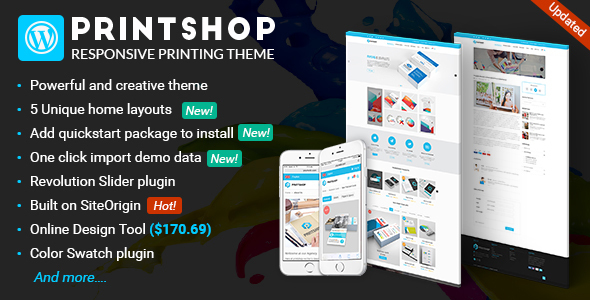 It integrates with any WORDPRESS PRINTSHOP THEME. This capability guarantees that your content will always come along with you, even when your design tastes change. The freedom to move forward. Use your favorite widgets: WordPress widgets are a site owner's best friend. Who are we to jeopardize that friendship? Page Builder uses the widgets you love, and we've integrated with some incredible plugins to give you even more. Page Builder and widgets – together forever. Mega Menu: With mega menu, you can manage and display all kinds of information flexibly optimizing your website navigation performance. One click demo import: Just 1 click, you can import the size that you want in our demo. Always ready for your customization. Redux Framework: Theme Options by Redux Framework brings you the easiest way to change theme options like a logo, color, fonts, shop page, header, and footer. Contact Form 7 Support: Contact Form 7 can manage multiple contact forms, plus you can customize the form and the mail contents flexibly with simple markup. The form supports Ajax-powered submitting, CAPTCHA, Akismet spam filtering and so on. This is a very good ecommerce template for traveling website, it gives you a lot of possibilities and unique pages. 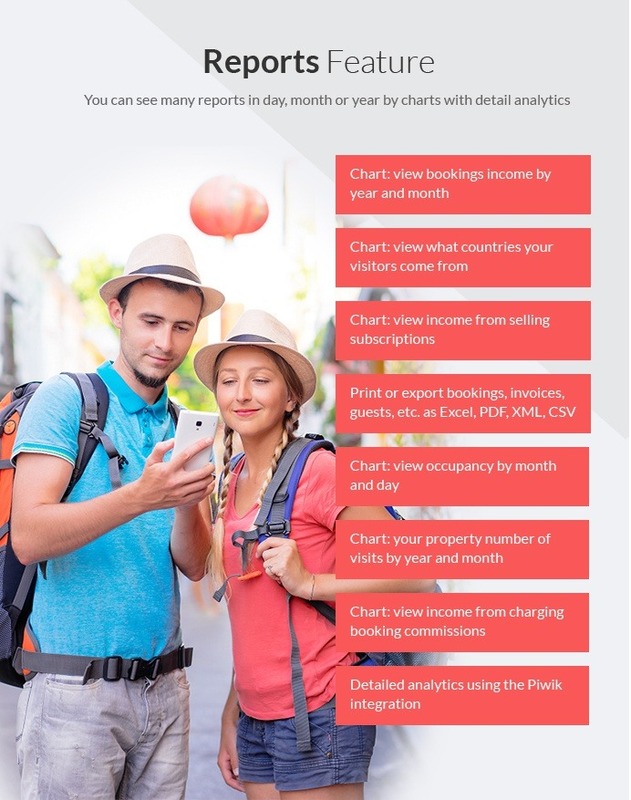 Any traveling business owners should consider it! Work better than I've ever thought. I really happy with my website. Hope my business can reach new level of revenue soon. At this moment, everything seems to go as what I expect, web management is also simple. I recommend this solution without any doubt! Appealing interface and full functionality. 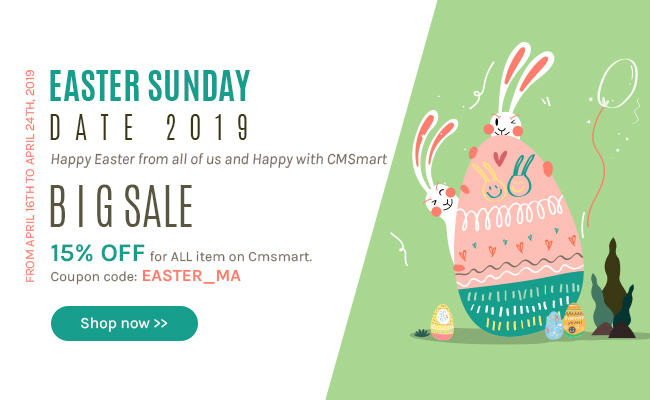 That's a great experience when working with Cmsmart team and using this theme. the first impression for this product is unique, modern and functional design. it's also easy to customize the time without writing code. High-quality and I love it! It's really great experience when using your Wordpress theme. I loved your initial design but after I changed some colors and elements to fit my own website, it looked fantastic. especially all changes were made by myself. So easy. Great!!! A fully responsive, full functionality and minimalistic but elegant theme is not easy to find. Your travel theme is a perfect match for us, as it is designed with a no-frills mentality. Joomres works amazingly also. Recommend it! try it and you won't be disappointed! Become a client on Cmsmart, you are protected strongly with our Client Protection Programe. Especially we built -in a strong Central Ticket Support system to help clients and partners working on the products item support after purchased. Responsive design: in the era when people use smart devices more than desktop, you have to make sure your website looks great on any devices. This is the item from Elegant themes which is designed around locations. 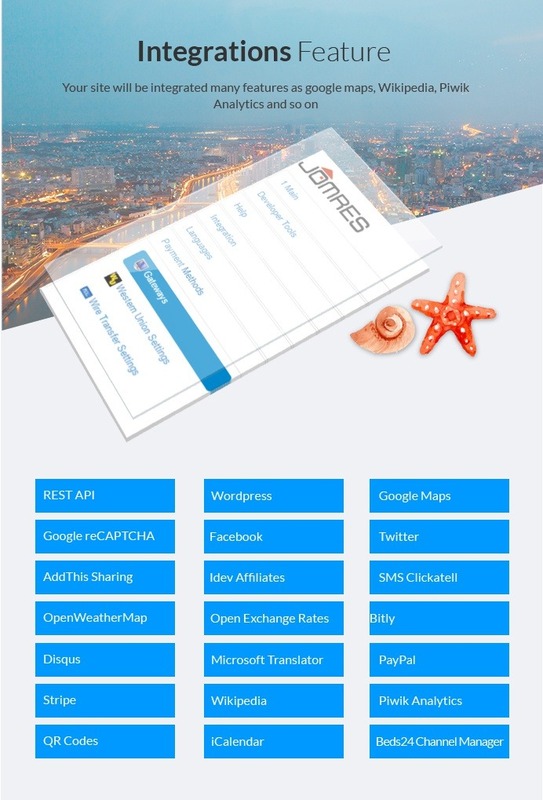 It will show the map of the world and allow visitors to tag posts to places on the map. This item would be the best choice if your target customer is travelers who wish to document their journey or travel guides who desire to write locations. The theme is well-designed and responsive with some great styling options and features that would be needed by travel sites. This is the theme that is designed especially for Hotels and other hospitality based businesses. Olympus Inn WordPress theme is retina optimized so your website will look great on all devices. This WordPress Travel theme has some unique features such as dynamic weather reporting, customer testimonials, attractions, multi-lingual plugin support. The homepage has a large slider and prominent booking form with a book now call to action to encourage users to book with you. Olympus Inn is customizable, allowing you to alter logos, colors, elements display and more. Zermatt is a special WordPress theme from CSSIgniter. It has been built to impress your audience and showcase your hotel at its best. 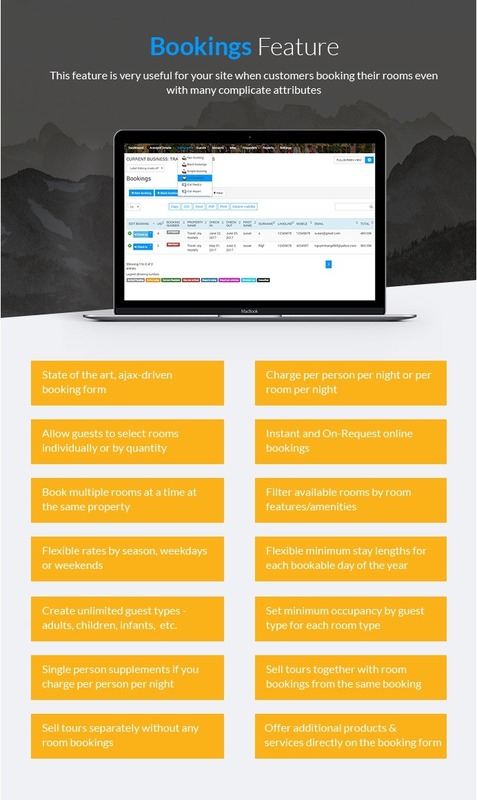 Zermatt features a fully integrated booking request form, which enables your potential customers to get in touch with you and make a reservation. 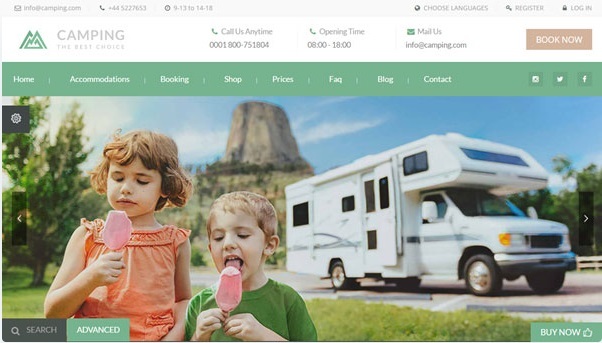 This WordPress Travel theme is designed for outdoor travel companies, caravanning parks, and camping grounds. 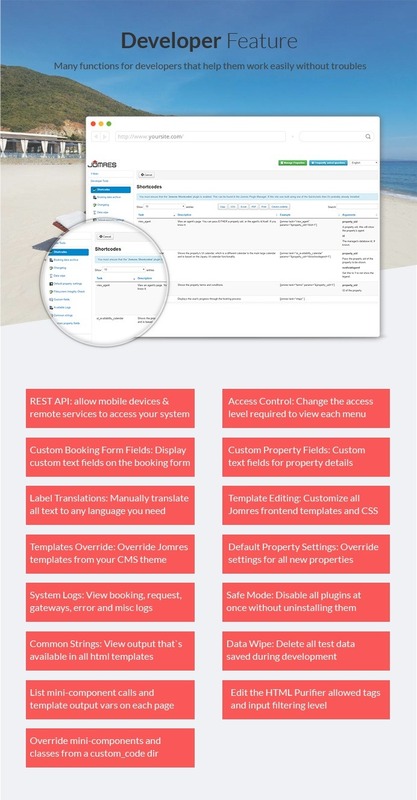 Use this theme to manage bookings of caravans, static holiday homes and tent pitches. Included with this theme is a booking system, a cost calculator, and a Google maps marker, to show the position of accommodation within your campsite. Before we commit to buy, I have a few questions. We do accommodation on hunting lodges in season and out of season,( for the south African market atm) later planning to open to the international market. BUT our rates are set in different structures. EG. Cost per Hunter, Non-Hunter, Children 2-7, Children 8 - 12 etc. Will we be able to set these different price ranges under each individual hunting lodge ? as without this feature it wont work, as we have found with other themes on the market. Hope to get feedback soon. Many thanks for your interest in our products. I am Janet, it is my pleasure to support you in this case. We are suspending selling this product to upgrade many new features in the future. So please wait for us when we release the version. It takes 6 months to release the new version. Jomres is a commission-free, responsive, Open Source online booking system used by thousands of businesses worldwide to manage their properties and reservations. Jomres is not a Cloud solution that could disappear at any time, and your business’s intimate details aren’t shared with anybody else. Jomres is not a Cloud solution that could disappear at any time, and your business’s intimate details aren’t shared with anybody else. 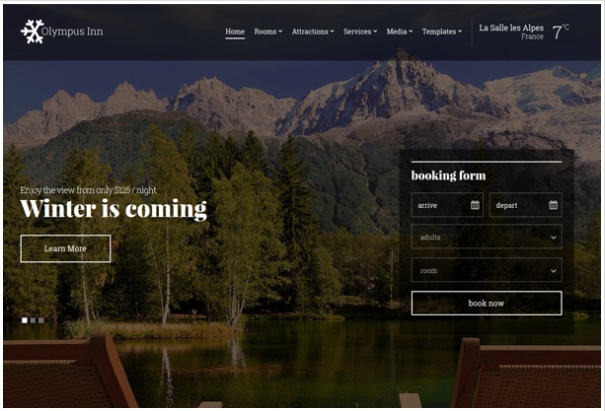 When Jomres plugin is integrated into this WordPress Travel theme, you can create an unlimited number of booking websites, accessible to customers on any device, in any language. It is obvious that WordPress is a very search engine and SEO friendly. This WordPress Travel theme is written by using standard compliance high-quality codes that comply with the rules of major search engines. 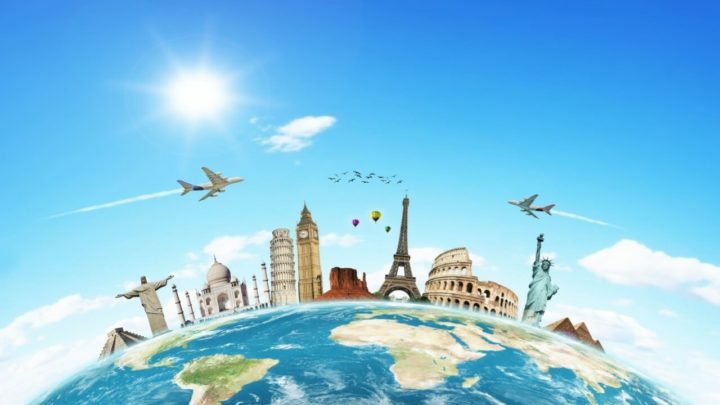 With an online business, especial working in traveling aspect, get high ranking on Google is actually important if you want to approach more customers and boost your sale volume. WordPress Travel theme is always the ideal choice. Not all business owners are master of programming so I have heard a lot of people complain that they worry whether they could customize the content or they have to hire other developers. I can affirm that with WordPress travel theme from Cmsmart, you can customize and manage even when you are not tech savvy. You can log in from anywhere that has an Internet-connected computer, to add content and manage your site. With as little as one-hour training, you could be easily be managing your own site. 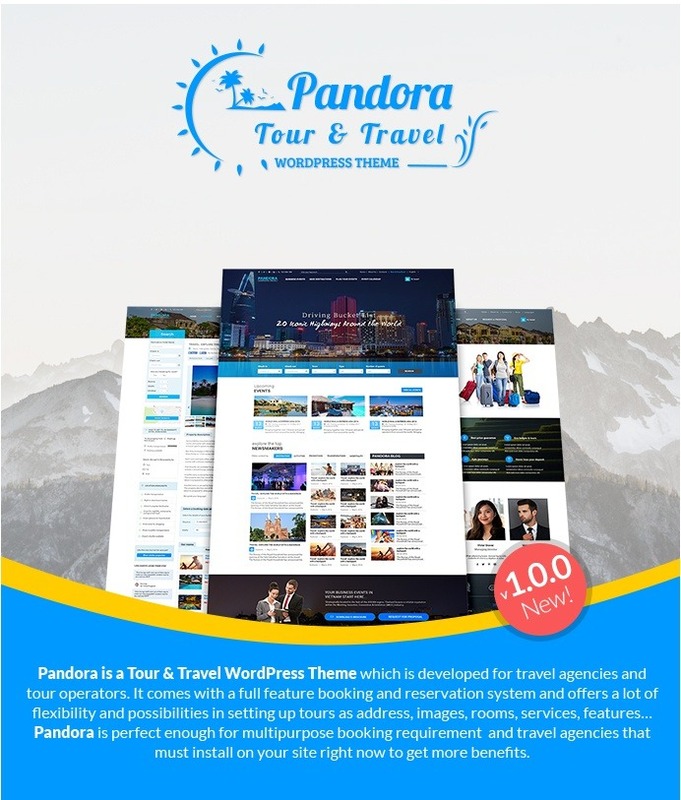 Tourism aspect is a large-scale business, when it is combined with WordPress, in detail is WordPress Travel theme, it would become a fertile plant for development of the business. So don’t hesitate to apply it to your website! You can use the product for your own website or your clients website if you are developer. You are allowed to use this extension on Unlimited website while our private support is base on domain. You can cancel renewal fee anytime if do not need while keep using the product for lifetime. You can cancel renewal fee anytime if do not need while keep using the product. Support Domain License Under a 1 support domain license for the item you are granted a non-exclusive non-transferable permission to use the item on a single site. If you plan to use the product on other domains, you SHOULD buy now to SAVE much better than buying separated order. We are proud ourselves to release our quality products to the e-commerce world. Since 2010 we aim to become the leader in providing completed ecommerce solutions to SMB business around the world. Today we have been supporting over 20000+ clients and work for 500+ projects on different aspect of development services for your ecommerce business. Become trusted partner and grow up with your business is our sole priority. Netbase Company (JSC). Copyright © 2011-2019 Cmsmart.net. All Rights Reserved. → Do you know the secret to create a printing site in a few minutes? → What is the latest technology of Online Design 2019? → How to start a marketplace site without any trouble? Join over 19,890+ readers as well as happy customers to open the successful key for your e-commerce business.